The objective of the Small Business Center Network (SBCN) is to increase the success rate and the number of viable small businesses in North Carolina by providing high quality, readily accessible assistance to prospective and existing small business owners which will lead to job creation and retention. The Small Business Center at Southeastern Community College is here to assist you by offering one-on-one confidential business counseling plus seminars and webinars on a variety of business topics. We are a community-based provider of education and training, counseling, networking and referrals. All of our services are free! Let our Small Business Center help you develop a plan of action to turn your dreams into a reality! The objective of the Small Business Center Network (SBCN) is to increase the success rate and the number of viable small businesses in North Carolina by providing high quality, readily accessible assistance to prospective and existing small business owners which will lead to job creation and retention. 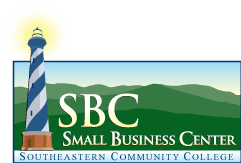 The Small Business Center at Southeastern Community College is here to assist you by offering one-on-one confidential business counseling plus seminars on a variety of business topics. We are a community-based provider of education and training, counseling, networking and referrals. All of our services are free! Let our Small Business Center help you develop a plan of action to turn your dreams into a reality!